Our group returned to Kathmandu yesterday after an amazing tour across the Tibetan Plateau from Lhasa to Rongbuk and returning to Lhasa. 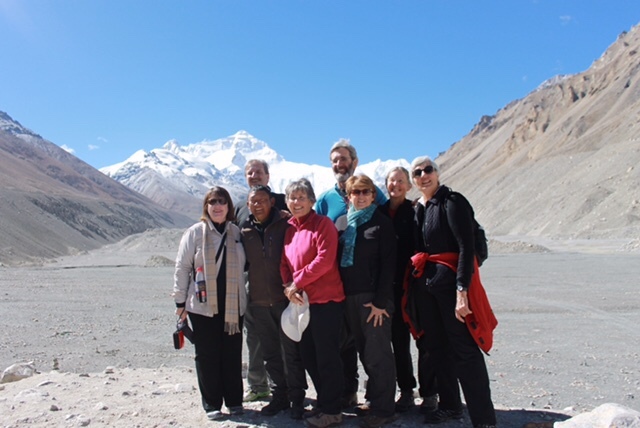 The highlight of their trip was to see Mt Everest on a clear sunny day, they all agreed that this exciting visit was an adventure of a life time. The group of 7 visited main cities of Tibet including Lhasa, Shigatse, Gyantse. Most popular monasteries like Potala palace, Jokhang, Sera, Drepung and Sakya. Passing through high passes of over 5000 meters, the landscape and beauty of the surrounding mountains and turquoise lakes was spectacular. We visited typical rural villages housing Tibetan nomads. Another highlight was flying to and from Lhasa from Kathmandu passing by snow capped mountains including several of the world’s highest.